The Druids held Mistletoe in great reverence as a sacred plant that could cure every ill.
Its traditional herbal use includes helping to normalize circulation, blood pressure, nervous and endocrine systems inc. pancreas, chronic fatigue, and metabolism, menopausal and period problems. Excellent for stress this deep, broad acting, yet calming herb is considered as a regenerative aid to health in many cases. The leaves, unlike the berries, are non-toxic and safe. We have replaced Mistletoe powder with capsules due to popular demand. We will no longer supply Mistletoe in powder form. Intensive Use: 6 Capsules daily. Capsules can be opened and content added to food (do not cook), or drinks. 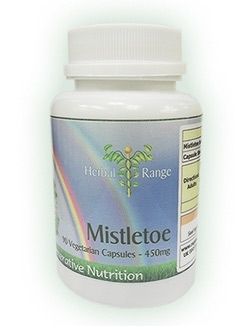 Mistletoe herb (Viscum Album) 450mg. Excellent for stress this deep, broad acting, yet calming herb should be considered as a regenerative aid to health, in many cases. The leaves (unlike the berries) are non-toxic and safe. The Druids held mistletoe in great reverence as a sacred plant that could remove every ill. It was gathered with great ceremony and cut from the tree with a golden knife. These days its wonderful virtues have almost been forgotten, many people think it is poisonous; this being true only of the berries, the leaves however are completely non poisonous and may be taken like any other herb on a regular basis. Experience at Regenerative Nutrition has shown that herbal remedies with broad-spectrum normalising abilities, which also heal the nervous system, are the most valuable. Many herbs have potential benefits not expressed in many patients due to the fact that there is much stress these days; most persons are suffering from some degree of nervous tension, tiredness, over-stimulation or enervation. The brain and nervous system has to process energy of change when any new nutritional or herbal treatment is introduced. Any chemical reaction in the body is accompanied or possibly even overseen by an electrical reaction. Mistletoe also has a good contribution in the treatment of fatigue and chronic fatigue, where hormonal and nervous systems need gently toning up at the same time. Medical herbalist Gerald Green states that mistletoe is the best herbal remedy for high blood pressure. In summary, due to its broad-spectrum normalising and toning effects, one may use mistletoe as part of a regenerative programme (see the Core Regime) alongside superfoods such as Pollen and Chlorella. From the Ayurvedic point of view Mistletoe is slightly heating (pitta) and reduces excess vata and kapha (excess air and damp, both stubborn conditions). Other master herbs that work on the hormonal system include Peruvian Maca and Wild Yam. Maca has adaptogen properties; this means it will also be quite stimulating and vitalising. If the nervous system is weak then Maca should be left till strengthening of the nerves has been achieved with mistletoe as part of a therapeutic regime. Wild Yam is calming and grounding, its sphere of action is somewhat different to mistletoe, it acts more on the progesterone pathway and has less direct effect on the metabolism and circulation.